Michele Connolly became an EMT in 2009, and her first assignment was working for a local transport company on Staten Island, New York. 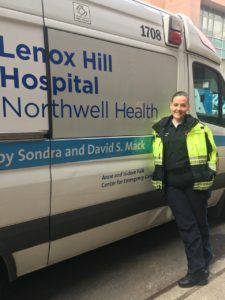 In 2011, she decided she’d like to experience the 911 aspect of Emergency Medical Services, so she joined Northwell Health Lenox Hill hospital to learn more about that area of the service. Michele is being nominated as a Star of Life for her dedication and her compassionate nature—she demonstrates these qualities every day, not only with her patients, but in all her interactions with her peers as well. In addition to her career, Michele keeps busy as a single mother to two daughters: Noelle, 18, who is attending college, and Madison, 15, who is a sophomore in high school. Family is important to Michele, and she tries to spend as much time as possible with her loved ones.